There are many who consider John F. Kennedy, the 35th President of the United States, to be the one of the most influential presidents within American history. His assassination came as a shock to many not only because of why it occurred, but also because of the way in which it was done. There are many theories as to why John F. Kennedy was struck down in the midst of his presidency. Some believe that he was indeed killed by a sniper but there are others that believe foul play was involved with the death of JFK. There are many reasons and speculations as to why was JFK assassinated. There are those who believe the assassination of JFK was a fully orchestrated plot carried out by the government. Some people believe this because there were great discrepancies involving the reports that were complied by government agencies and local law enforcement in Dallas where JFK was killed. The level of secrecy around the JFK's death and the conflicting reports made many believe that the government was involved in the assassination. Many people also believe that Lee Harvey Oswald was used as a pawn in the government's plan to assassinate JFK. When the American people are asked about the circumstances surrounding the death of John F. Kennedy, more than half of those polled believe that there is a conspiracy linked to JFK's death. Some believe that Oswald was an agent of the Soviet Union or was working for one of the local political groups which held anti-Kennedy sentiment and were not in agreement with Kennedy's stands on Cuba, organized crime or civil rights. President John F. Kennedy was assassinated on November 22, 1963 in Dallas, Texas. The President and his wife Jacqueline were riding in an open motor coach in Dealy Plaza with the Governor of Texas, Mr. Connally, and the Governor's wife, Nellie. 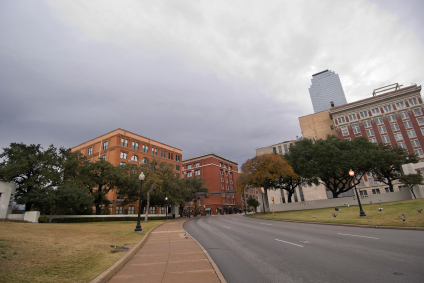 The President's motor coach was moving along its scheduled pathway past the Texas School Book Depository onto Elm Street. Once the motor coach reached Elm Street, three shots rang out. There are many who were present who report that they thought the three shots were backfires from a vehicle. However, they were not. When the President began waving to individuals, the first shot was fired and those seated in the vehicle with him looked over to find JFK holding his neck and head. The first bullet hit his upper back, went through his neck and exited through his throat. Jacqueline Kennedy was by JFK's side at the time. With help of secret service agents, JFK was rushed to Parkland Memorial Hospital. Upon arrival at the hospital it was determined that he had no chance of surviving his injuries. Less than thirty minutes after the incident, JFK was pronounced dead. His body was placed on Air Force One to return to Washington D.C. and Lyndon B. Johnson was sworn in as the 36th President of the United States of America while on Air Force One. JFK's body would later be interned in the East Room and then moved to the Capitol for a public viewing. His body was laid to rest in Arlington National Cemetery. The man that was charged with his death was Lee Harvey Oswald. Oswald was a former United States Marine who lived in the Soviet Union before returning to the United States. He was an employee at the Texas School Book Depository, which is not very far from the location at which JFK was assassinated. Oswald is widely considered to be the person that assassinated JFK. He was captured by Dallas police for the murder of J. D. Tippit, a Dallas police officer the night of the JFK's death and was later linked to the assassination of JFK. Oswald would never be officially convicted for killing JFK, as a night club owner named Jack Ruby shot Oswald on live television as retribution for the assassination of JFK while he was being escorted to a police car by Dallas police. A a number of investigations headed by the Dallas Police Department, FBI and CIA all concluded that Lee Harvey Oswald was the individual that assassinated John F. Kennedy. "Why Was JFK Assassinated?." YourDictionary, n.d. Web. 22 April 2019. <https://biography.yourdictionary.com/articles/why-was-jfk-assassinated.html>.